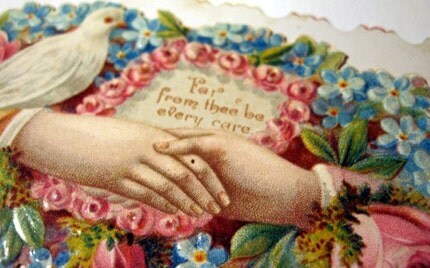 I just updated the shop with some one-of-a-kind Victorian embellishments. These are not reproductions, but the real thing and are in great condition. Two of them are glued on calling cards. Each has a name on it. The glue is almost gone, so they could be easily taken off. I just found the names on the card while I was doing this and it was very exciting. are the names. I get such a thrill out of these kind of things. And thank you so much for your sweet comment over at my little blogling,too! :) So glad I popped in, it's ever so lovely here! !